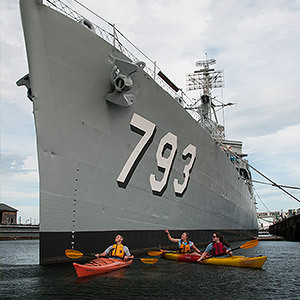 PADDLE BOSTON offers several convenient rental locations in Greater Boston. On a beautiful summer weekend we rent to thousands of people just like you! We know that renting for the first time can seem daunting, but it’s really easy. Learn everything you need to know about our rentals below, and e-mail us if you can’t find the answer. A: Probably not! We accept reservations only if you are renting eight boats or more; for regularly scheduled Classes, Tours, and Trips; and for events with guiding/instruction. Our locations have lots of boats, and it is rare that we have a wait at any of our locations except on the busiest weekends between Noon and 5pm. We can almost always accommodate you, especially if you are flexible about the type of boat you want. A: If you are renting eight boats or more, or are looking to schedule an event with guiding/instruction, send us an email or use our Group Outing Request/Instant Quote Form to request a date online! 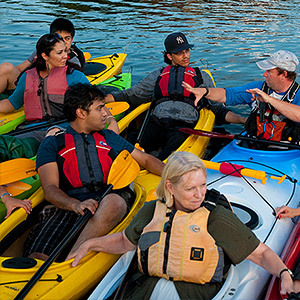 A: Your rental includes life jackets and paddles for each person. We have life jackets for all ages and sizes, from infant on up. We have paddles for kids starting at age 4–6. Kayakers who have performed a wet exit (where you flipped the kayak, removed the skirt, and exited) may take a spray skirt upon request (subject to availability). We also have pumps and rescue floats available upon request (subject to availability). Q: Do I have to wear my life jacket? A: Absolutely! Each participant must sign a waiver stating, among other things, that you will wear your life jacket throughout your rental. 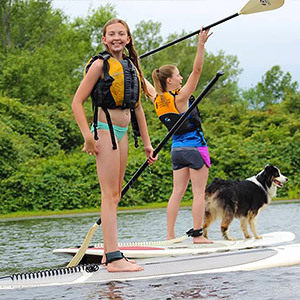 The life jacket will keep you afloat even if you are tired or cold, and is a critical piece of safety gear. It is very difficult to put on a life jacket when you’re in the water, so wear it all the time! A: Paddling is a water sport, so you should wear clothes and shoes that you don’t mind getting splashed or dripped on (and there is a chance of capsize, though the overwhelming majority of our customers come back dry and happy!). Most people wear street clothes (jeans, T-shirts, etc. ), though others choose more specialized synthetic fabrics that dry more quickly than cotton (like polypro or nylon — think ‘running clothes’). Dress for the weather, including a fleece when it’s colder or a jacket when it’s raining. Sneakers are fine, though some customers prefer sandals, water shoes, or flip-flops. Nicer shoes are not recommended because they are likely to get wet. A hat, sunglasses, and sunscreen are recommended. If you wear glasses or sunglasses, a retaining strap like Chums is strongly recommended. When the water temperature is below 50°F, the danger of hypothermia is so high that we require paddlers to wear wetsuits. Read our Cold-Water Policy to learn more about cold-water paddling. We don’t want to frighten you, but we do want you to know that paddling small boats does involve a risk of capsize. You can minimize this risk by choosing a stable boat (just ask the dock staff! ), remaining seated in the middle of the boat, and not making any sudden movements. The vast majority of our customers return to the dock dry and happy! A: The only things you need for your rental are a form of payment and a Photo I.D. (driver’s license, passport, or other government-issued identification). However, you will probably want to bring water, a snack, a hat, sunglasses, and sunscreen. If you plan to bring a camera, cell phone, or other electronics, you should bring a waterproof container or plan to rent a drybag for $1. If you wear glasses or sunglasses, a retaining strap like Chums is recommended. You may want to keep a towel in the car for after your paddle. A: We do not have lockers at any of our locations. 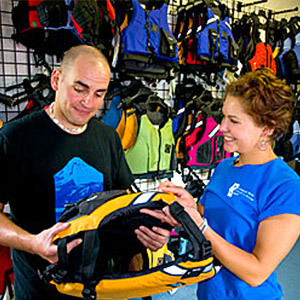 You are welcome to rent a drybag for $1 and take your items with you on the boat. Please leave unnecessary items in your vehicle, if possible. Q: Can I bring food in the boat? A: Of course! You are welcome to bring food and stop along the way for a picnic or just a snack. Q: Can I bring alcohol in the boat? A: Boating and alcohol do not mix, so alcohol is strictly prohibited. Feel free to go out after you paddle! Q: How much does it cost? What if I stay out for longer than one hour? A: View our Rental Rates page to view rental rates at all our locations (they are the same everywhere). There is a one-hour minimum charge, and then we charge by the tenth of an hour based on the amount of time you are on the water. If you stay out for an hour and 20 minutes, for instance, you’ll pay 1.3 times the hourly rate. If you stay out longer than four hours, you’ll pay the day rate, no matter how long you’re out! Just be sure to return before closing time. Q: What types of boats do you have? 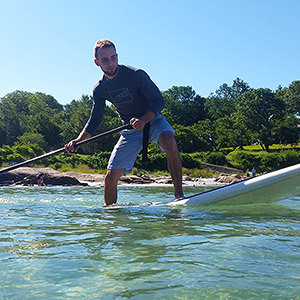 A: All our locations have stable single and double recreational kayaks, standard and large canoes, and stand-up paddleboards. Beyond that, we may have sea kayaks, paddleboats, rowboats, rowing shells, and more depending on the location. You can view the boat types we offer at each location here: Cambridge, Boston, Newton/Nahanton Park, and Waltham. Boats are subject to availability. A: We accept cash, Visa, MasterCard, Discover, personal checks (with Photo I.D. 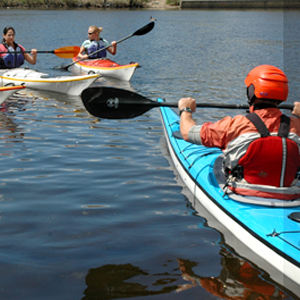 ), traveler’s checks, and Gift Certificates from Charles River Canoe & Kayak and Weston Ski Track. Q: Where can I paddle? A: See all of our rental locations here, each has a different water environment. Click the images to view more about that location, and once there you can click on the “More About…” link to read about the experience, or the “Paddling Maps” link to see a map of the waterway. Q: Can I take the boat somewhere else? We offer Off-Site Rentals so you can take our rental boats to the location of our choosing. Pick up and return your boat at our Boston: Allston/Brighton location. A: It depends on which location you are visiting! Q: How late can I start my rental? A: The last boat goes out one our before closing time and there is a one-hour minimum rental charge. There are no exceptions, it’s not safe to paddle in the dark! Q: How long do people usually stay out? A: Our average rental is an hour and a half. A: It depends on which location you are visiting! Look at the pages for each location separately. Q: Can I bring my young child? A: Absolutely! We have life jackets for all ages, from infant on up. Some people start their kids as early as six months. As long as you feel comfortable bringing your child, we’re happy to accommodate you! Just don’t strap your child into the boat. Q: Can my children rent without an adult? A: It depends on how old they are. 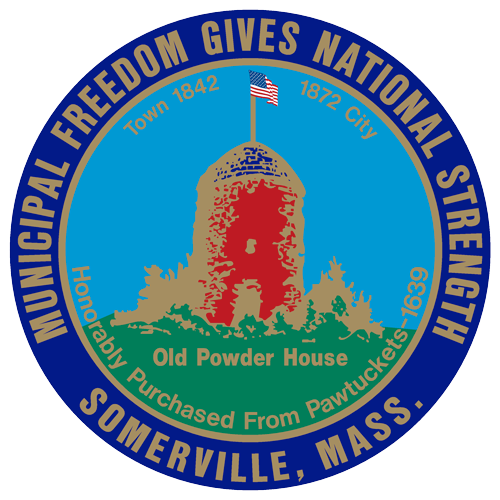 View our Age Policy. Q: Can my children take their own boat? Yes! You’ll just need to accompany them on the water until age 16. We generally start kids in their own boats around age 6—8, depending on their maturity and your comfort level. 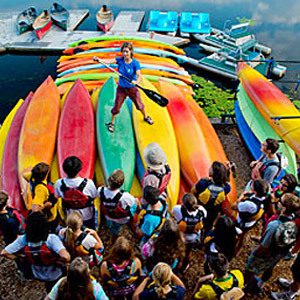 Boats that work well for kids are double kayaks, single kayaks, and canoes. Q: I want to bring a group of children. How many adults need to come along? It depends on how old the kids are. View our Age Policy. You are certainly welcome to bring your dog. Be aware that some dogs do jump out of the boats, and you should be prepared to get them back in. Don’t tie your dog to the boat! We have a small selection of Dog Lifejackets available at each of our locations. Q: What if I can't swim? A: Everyone is required to wear a Coast-Guard-approved life jacket while on the water, and these are designed to keep you afloat even if you can’t swim. You are certainly welcome to rent if you can’t swim.